Luxurious details and an affordable price make this long prom dress ideal for the budget-minded girl that wants to stand out at her formal event. Under $100, this modestly-priced chiffon evening dress is an elegant style with lavish embroidery on the bodice and scalloped trim at the surplice v-neckline. The sheer back and three-quarter sleeves are adorned with textured floral-lace appliques, while a band of gorgeous ladder lace circles the natural waistline. The long a-line skirt has soft layers of silky chiffon that offer a lovely silhouette as they flare away from the hips before flowing down to the floor. 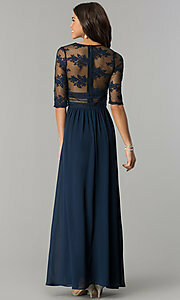 Well-suited for a military ball or winter formal, this long prom dress defines femininity without breaking the bank.